An injured woman outside Parsons Green tube station. With schoolchildren and commuters squashed in like sardines, no one paid much attention to the white bucket in a plastic bag yesterday morning. 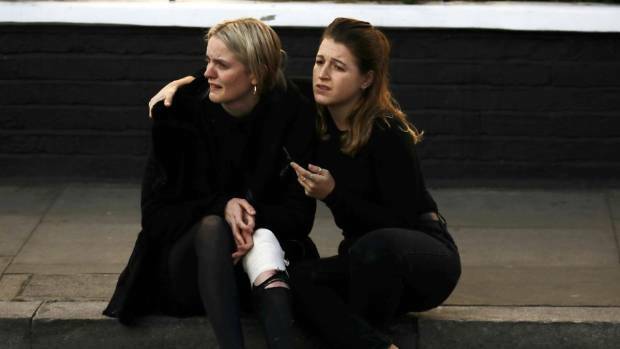 After mingling among the victims, the terrorist who dropped off the makeshift device simply slipped off the packed rush-hour Tube train – leaving the timebomb ticking at their feet. Had it worked as intended, a massive blast of fire would have killed dozens on the new, open-plan style train which – at 8.20am yesterday – was close to its capacity of nearly 1,000 people. Miraculously, the main charge – apparently on a timer – failed to fully detonate. But the partial explosion was still enough to create a giant fireball – and then pandemonium. In a dangerous stampede to escape, a pregnant woman and schoolchildren were among those crushed. Gillian Wixley, 36, who lives in Putney, was eight seats from the explosion. She said: ‘It was chaotic: There were lots of people panicking and people were injured due to the crush. ‘Everyone was very emotional. There was one boy maybe age ten who was commuting to school on his own. He was sitting on the floor sobbing. The train is regularly packed full of schoolchildren. The Fulham area serves at least three state secondary schools: Fulham Boys School, The London Oratory and Lady Margaret Hall along with a number of independent schools. Lady Margaret Hall schoolgirl Emanuella Mensah, 16, described the panic. I was right outside the corner shop when people started running from the station. People were shouting “run, run”. I saw old people, people with their kids. Then someone shouted “terrorist!”. More people kept coming out of the station. She said the younger children were particularly shocked and scared and that the distress carried on throughout the day. ‘Years seven, eight and nine, they were all on the phone trying to call their parents. People were crying everywhere. Louis Hather, 21, a computer programmer, hurt his leg in the scramble to escape the train. He said: ‘There were so many children going to school on that train. We are so lucky that it seems the bomb did not go off properly. ‘I was just on my normal commute in and the train was rammed. We were stuck in like sardines. I was facing away from the bomb when suddenly I heard screams; they were the kind of screams that tell you something serious had happened. ‘There was something about the urgency in the way people were trying to get away that made me think that. It was sheer panic. I knew I had to get out as soon as I could so I ran towards the stairs but everyone was rushing and lots of people were falling along the way. I tried to stay up but was being pushed all over the place. There was a big crush on the stairs, with a pile-up about halfway down.